Sustainable development is a hot topic and receives a lot of interest. However, to bring sustainable technologies into practice for commercialisation is a challenge. Delft Centre for Entrepreneurship tackles these skills during their course ‘Cleantech Business Study’ , in which a number of student teams develop sustainable business ideas and analyse their feasibility for commercialisation. The ideas are judged by a jury as part of the international business competition CleanTech Challenge. The Dutch competition was won by team Ecoplanks, which made it to the international CleanTech Challenge finals in London 23-27th April. 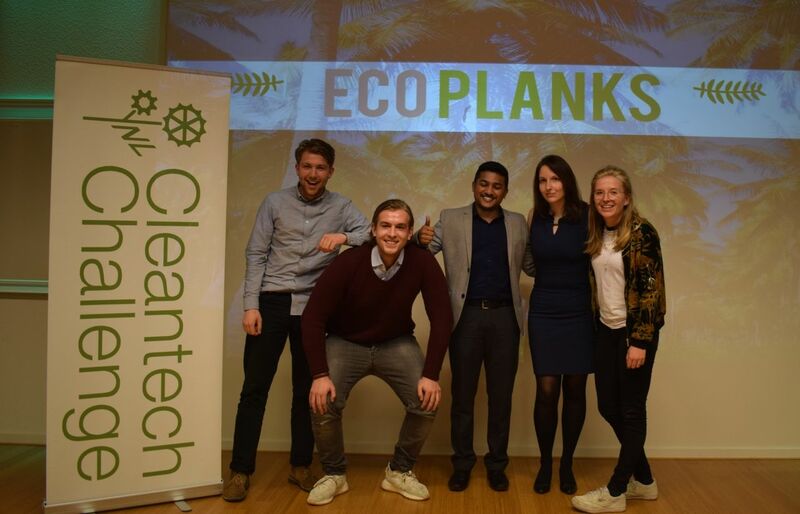 The Ecoplanks team was selected with their business idea for an innovative way of producing ‘wooden’ planks out of coconut waste material. The team was entitled to coaching sessions by Leon Pulles from Energy Investment, that helped them to transfer their business idea into a successful business. Team member Victoria Brood “In the CleanTech Challenge you learn so much in such a short time period and have to grow up very quickly business-wise. We really tried to find out each team member’s strengths and tap into those strengths to maximise efficiency and creativity.” This strategy paid off since the team ended 2nd in the London finals!